Of all of the more commonly available orchids, only Phalaenopsis (the moth orchid) will re-bloom from its old spike. Phalaenopsis will generally re-bloom given a little extra care. When the last flower fades, you can leave the spike (stem) on and it will still continue flowering but the stem gets very ungainly and the flowers get smaller. 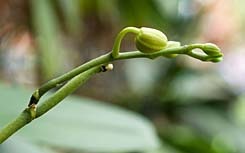 Some people believe it is best to cut off the stem entirely at the base where it comes out of the leaves, and it will bloom again in several months. You can also cut off the stem leaving two nodes (those little brown lines on the stem below where the flowers were) on the stem. One of these nodes will then initiate and generally produce flowers within eight to 12 weeks. Younger or weaker plants may not rebloom and some Phalaenopsis are genetically incapable of reblooming from the old spike. These are usually those that flower with branched spikes. It’s always worth a try. Orchids, like animals, are susceptible to viruses, so whenever cutting an orchid plant always use a sterile tool to prevent the spread of virus. A straight edged razor blade is a good tool to use for cutting flower spikes.